Dan Aykroyd, actor, comedian, musician, and filmmaker has been tapped to create the official Caesar of 2018 for National Caesar Day. “When I learned Canadians consumed more than 407 million Caesars last year alone and that a group of Caesar-loving Canadians created a day just to celebrate Canada’s Cocktail, I knew I wanted to be a part of it,” Aykroyd was quoted as saying in a statement released Wednesday. Canadians celebrate National Caesar Day on the Thursday before the Victoria Day long weekend in May, to honour Canada’s official Cocktail, as declared by Parliament in 2009. Aykroyd calls his creation The Hot Head Caesar, which combines fresh garlic, lime juice, and sriracha sauce with his own Crystal Head vodka and Mott’s Clamato. However, unlike traditional recipes, there’s one thing missing – the garnish. 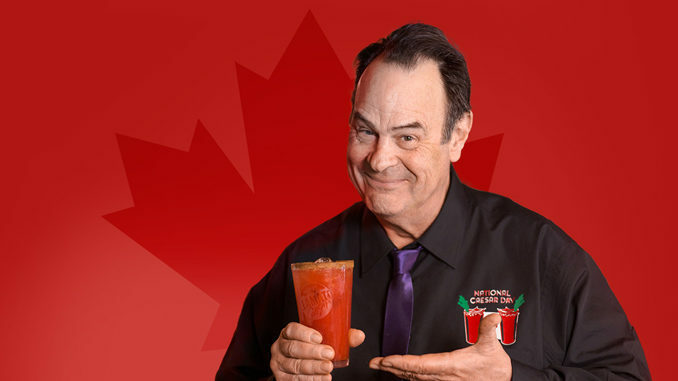 Aykroyd is asking Canadians to help him find the best garnish for his Caesar. Canadians can submit their recommendations for Aykroyd to review at GarnishDansCaesar.ca. The person with the best suggestion – as determined by Aykroyd – will join him in Toronto on May 17, to celebrate National Caesar Day. Submissions will be accepted through May 2, with the winner being announced on May 7, 2018.